Almost four years ago I wrote my first post on Rheumatoid Arthritis tests. This is the 29th. Obviously, tests are a key topic in RA diagnosis and disease assessment. 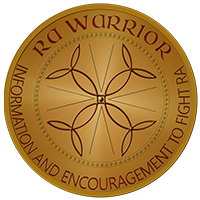 Many still ask about “the RA test” which doesn’t actually exist. Several tests are used to inform about Rheumatoid Disease, but none is a dependable indicator in all patients. Some patients tend to have normal test results on CRP tests, ESR (sedimentation rate) tests, or anti-body tests like Rheumatoid factor and anti-CCP. Thus, the search for more tests, or one that is relevant to more people. A new test for Rheumatoid Arthritis that recently became available in the U.S., 14-3-3η, appears to gauge disease severity and reflect treatment response in many patients, including those with lower CRP. 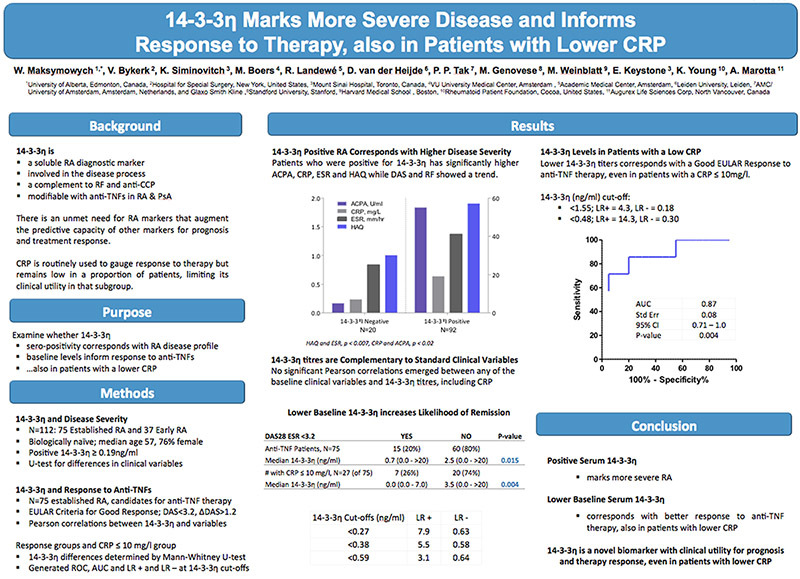 The abstract below published this month at EULAR shows 14-3-3η associates with response to anti-TNF therapy, even when CRP does not correspond with treatment response. This study of 112 patients was performed on banked blood samples. Let us know about your real world experiences with this test. Look closely at the author list of this EULAR abstract to see why I’m so interested in the results. Background: There is an unmet need for RA markers that inform prognosis and treatment response. While RF and anti-CCP are useful, augmenting their predictive capacity with additional markers is desirable. CRP is routinely used to gauge response to therapy but remains low in a proportion of patients, limiting its clinical utility in that subgroup. 14-3-3eta, a soluble RA diagnostic marker, is involved in the disease process, complements RF and anti-CCP and is modifiable with anti-TNF therapy in RA and PsA. Objectives: We examined whether positive serum 14-3-3eta corresponds with RA disease profile, and whether baseline titres inform response to anti-TNF therapy, also in patients with a lower CRP. Methods: Serum 14-3-3eta was measured in banked samples of 112 patients with established RA (N=75; RAPPORT cohort) and early disease (N=37; TEACH and I-COBRA cohorts). Patients were biologically-naïve, median age 57 and 76% female. 14-3-3eta was considered +ve at >0.19 ng/ml and median differences in clinical variables between 14-3-3 eta +ve and -ve groups were evaluated using the Mann-Whitney U-test. For relationships between the clinical variables and 14-3-3eta, Pearson correlations were run. The 75 established RA patients were candidates for anti-TNF therapy and 14-3-3eta serum concentrations were additionally measured at ~15 weeks post-treatment. EULAR criteria were used to define Good response. Across the group and in patients with a low CRP (≤10mg/L), the significance of median differences in 14-3-3eta expression between Good EULAR responders and non-responders was evaluated using the Mann-Whitney U-test. A ROC curve and corresponding AUC was generated. Results: Of the 112 patients, 92 (82%) were 14-3-3 eta +ve and 20 (18%) were -ve. In the 14-3-3eta +ve vs -ve group the following medians were significantly higher; HAQ (1.9 vs 1.0, p=0.001), ESR (40.5 vs 25.0mm/hr, p=0.007), CRP (18.8 vs 6.6mg/l, p=0.018) and anti-CCP (54.6 vs 5.0U/ml), p=0.02); while DAS28 (6.7 vs 6.0, p=0.16) and RF (12.0 vs 8.0IU/ml, p=0.12) showed only a trend. No significant Pearson correlations emerged between any of the baseline variables and 14-3-3eta titres, especially CRP. Of the 75 established RA patients receiving anti-TNFs, 15 (20%) achieved a Good EULAR response and had significantly lower median baseline 14-3-3eta than those that did not (0.72 vs 2.52ng/ml; p=0.015). Low CRP did not correspond with treatment response and 27 of the 75 patients (36%) had a baseline CRP ≤ 10mg/L; 7 (26%) of which achieved a Good EULAR response and had a lower median 14-3-3 eta than the 20 that did not (0.0ng/ml vs 3.5ng/ml; p=0.0043). The corresponding ROC AUC for response in the low CRP group was 0.88 with an optimal 14-3-3eta cut-off of 0.48ng/ml; LR+ =14.3 and LR- =0.31. Hi Judy, it says the test can be used to show severe disease activity even in people who have a normal result in other tests, like CRP (which most docs use). And it looks like it might help determine who would respond to TNF medicines like Enbrel. Under what name do we ask for this test? Is it readily available? Charlotte, it’s under that name, 14-3-3eta. If you click on the first link to it in the second paragraph, that will take you to the other post that talks more about where to get the test. It looks like the name is kind of intimidating people that it’s hard to understand. I’m not sure whether they will create a new name or patients will just get used to it like they did for anti-ccp. This test,very exciting news! Now to get a doctor to do it, another challenge. I will watch the comments to see if anyone has had this done. This may be a great test for you Kelly! I had a genetics test through 23andme, there price is only $99.00 now as opposed to a few years ago it was $399.00 I believe. One of my flagged risks was for Rheumatoid, no surprise there, but I found other genetic disease risks that I wasn’t unaware of. They showed I had 6 different genes that increased my odds of getting Rheumatoid with the strongest one being in the gene HLA region. Thanks for your good work here! This is VERY fascinating. Tests like this (and many more in the future, hopefully) will make it easier, and cheaper to figure out which meds help vs. the hit or miss method now. For the first time since I was dx over 30 years ago, my CRP is elevated (I’m in a flare no different than any other). I’m living proof CRP is not a great measure of disease activity. I know you’ve had normal CRP too Kelly. This is great. It looks like many of the test subjects considered seronegative did show a + response to this test. Is this one reasonably priced? I wonder how long it will take for doctors to start routinely ordering it. Kelly, did you ever dream that biochemistry would be your next career? Congratualtions on having a second article published this year. I was having some difficulty following some of this as well. I got your main point about this test working to determine RA activity even without elevated CRP levels but completely missed the part about helping to determine whether TNF inhibitors would help. I’ve been pretty tired lately. Guess I skimmed, lol. So is there any indication that this is helpful in seronegative disease? My CRP has in the past been slightly elevated but never off the hook no matter how awful I have felt. Biologics banged those numbers way down. I guess my base levels are pretty low. Fortunately, my rheumatologist never said my CRP was too low for me to feel so bad. He has always treated my symptoms, not my test results. Lucky for me! according to the main post on 14-3-3eta (https://www.rawarrior.com/new-blood-test-for-rheumatoid-arthritis-14-3-3eta/), based on what I’ve read, the test outperforms Rf in identifying RA early. So it would identify at least some people who are seronegative. Still no magic bullet but another tool in the toolbox. So I didn’t say anything “sensationalistic” – you know me, always wanting to get more evidence. Hi Kelly. Do you know if this test works if someone is already on a DMARD? I am still seronegative for all markers for RA. My Rheumatologist is only focused on my confirmed “sicca” syndrome symptoms though I truly believe I have RA. I am currently taking Leflunomide (Arava), Hydroxychloroquine, and Folic Acid. I was giving myself a shot of Methotrexate every week for a year, but I was continuing to get worse. I’m somewhat confused with my Rheumatologist since it appears he is treating RA eventhough he never discusses the disease with me. He appears to be agressive with treatment but very conservative with the diagnosis and still only reports sicca syndrome. I would really like to know for sure that I’m not putting all these drugs inside me for the wrong reasons, though my gut tells me I’m not. By the way, I have had symptoms and been on treatment for 4 years now. Both my knees are pretty trashed. I have bursitis of both hips. My feet and hands bother me constantly. Both pointer fingers are constantly swollen at the PIP joint. Both pinkies hurt at the MCP joint. Both elbows hurt at different times. I have a lot of moving pain but it is always focused at the joints. I’ve been having more issues with my neck as well. I do not have low grade fevers, but I am always tired. If I sleep, I feel more tired when I wake up. I could go on but won’t. My first doc ended up referring me elsewhere and closing her practice. The second doctor said that if the labs don’t show it, I don’t have it. He more or less said that I was a faker and whiner and my first doctor was an unscientific slob. (I don’t know if having a definite diagnosis would have changed his perspective. Having a positive test result would have.) Do I need to say I’m looking for a third? The American College of Rheumatology’s own website says that only 65% of RA patients will ever show a positive anti-CCP, and something like 80% will “eventually” show a postitve RA factor. If this new test has far fewer false negatives, especially in the early stages of disease, it will be a huge help in diagnosis. Looks like it may also be helpful in diagnosing PsA, which currently is diagnosed in part by an absence of positive blood tests! When the standard of care calls for “early and aggressive” treatment, this test will help people get that. The best doctors rely heavily on their own observations and what their patients tell them. The less-than-best (and many of us don’t have access to the best) may be spurred to action if there is a test that’s more accurate. You would obviously feel better about your treatment plan if you had positive test results. Very well said, Anne. Good luck in that search. Thanks, Anne, for your response. 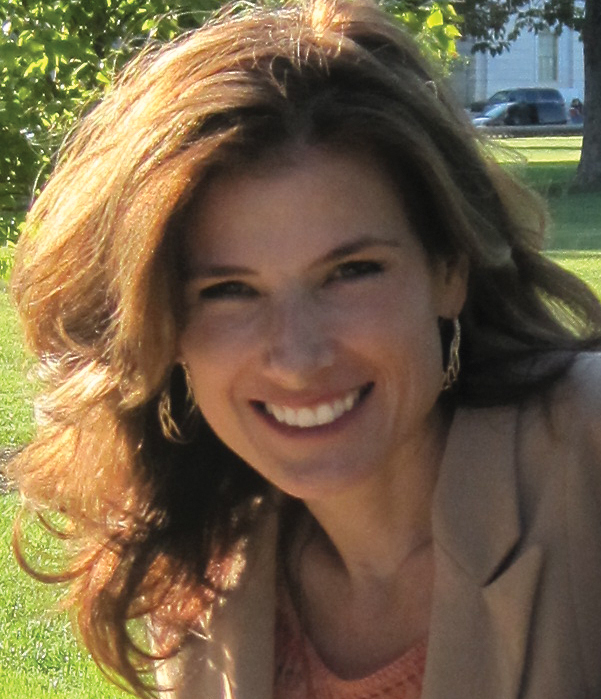 As always, thanks Kelly for the avenue to dicuss our thoughts and concerns and for your blog. I’ve learned through many blood tests that drugs can change results. I’m wondering if DMARDs or Biologics could change the results of the 14-3-3eta? Maybe it’s too new of a test to know?!? I’m seronegative and my diagnoses was undifferentiated inflammatory arthritis until my Dr wanted to put me on a biologic. The insurance company requires an RA diagnoses so that is what I got. 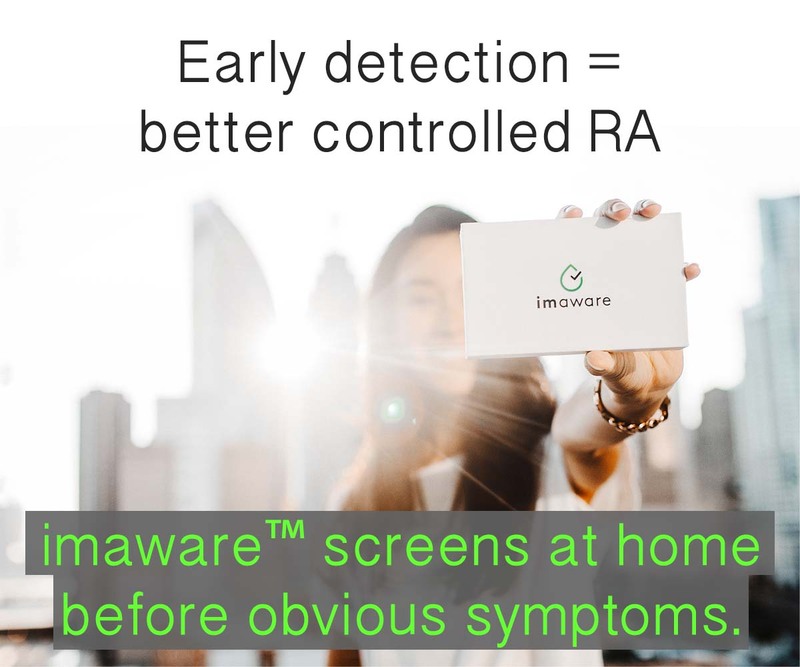 I think that a lot of rheumatologists believe that without the the Rf factor it isn’t truly RA but the good ones know that they can treat that undifferentiated inflammatory arthritis or seronegative RA that supposedly doesn’t exist exactly the same way you treat seropositive RA and it will respond as well. The work with and around the insurance companies and they treat their patients as well as they can. thanks, Leslie. It bothers me because the lines are not that clear in real life & payers, as well as some doctors are confused (and many patients too). The Rf is not a thumbs up or down like red hair or blue eyes. It changes over time, often becoming positive in established disease, but levels still varying – & not necessarily according to disease activity. I’ve seen enough people with severe damage and no Rf that it bothers me to see them doubted just based on that test. thank you for taking time to say so Lene. You are such a gem. Nice to see this. My ESR and CRP are always normal regardless of my disease activity. Fortunately my rheumy goes by more than bloodwork, but another tool in the arsenal is good to have. Roberta, I’m so sad & also frustrated that a doctor would do that to you. We have to find a way to help these doctors become better informed. Sounds like you’ve decided to give him another chance, but keep your eye out in case you find a better one. Had this test done. 14-3-3 eta was positive. Went to a rheumatologist, who dismissed this test, and refused treatment for RA bec. I did not have any of the “classic” signs of RA. Kelly, can you please contact me- to help me find a rheumatolgist who will warrent this lab test. I just went to my Dr yesterday, and i finally have a diagnosis that fits. Initialy diagnosised as RA after an acute flare up at 17, I have suffered for 15 years with feeling like I was crazy because all my levels were normal. My rheumatologist was awesome, he listened, tried his hardest to figure out if I was in remission or just not actually suffering from RA. After losing my insurance I hadn’t seen him in 6 years until last month when I got insurance again and he told me about a new test that could confirm his hunch of psoriatic arthritis. Then yesterday I grinned like a fool when I was re-diagnosed with PA, then I cried. My levels all were amazing, but my 14.3.3 ETA Protein is at 11.8 which amazed him that I’m still fairly asymptomatic. My x-rays were labeled as normal by the techs but his own look at them showed fuzziness at my sacral joint, verifying the pain I’ve lived with for so many years. My doctor is letting me wait to begin treatment, at 32 it’s now time for starting a family. I was told playfully to hurry up in order to prevent any further damage by starting medication after having a baby. I’m so grateful for this test, it is a miracle for those of us with “normal” numbers. My question. For others that have had the test is what are your numbers? I haven’t seen much information about how high/low average positive tests are coming back at! I just had the eta protein test done a few months ago. In the past I have had high CRP levels (20.1) & mildly positive RF (21). I have severe arthritis all over including my knees, spine, etc starting in my early twenties (now in mid-40’s). Apparently the eta protein test should be 20. It couldn’t even register the level was so high. I’m waiting to see my rheum next month. We shall see what his diagnosis is!! Wish me luck! I posted last year about this test. I’ve now had it run 4 times. Last time was a week ago. I’ve yet to have a result that the lab can actually run. My results r higher than the labs cutoff of 20. And my latest test last week was with me being on Imuran. So who knows how high my levels actually are. Anyone else have consistent results this high? But I don’t really show erosion on X-rays. Why is this?? The 1st thing is that erosion is a separate symptom – one of several that can occur as part of disease activity. Similarly, that blood test is one protein that can be elevated in RD. Frequently, they are not all elevated at the same rime. I hope this helps you see why you could have a level elevated and not necessarily have every other symptom at the same time. That is the nature of the disease. Also, xrays show erosions after they are a certain size – and are very dependent on how they are performed and read. Small erosions could easily be missed – or maybe they haven’t occurred yet. Finally, many labs are reported as out of range with > or < . If the results are very high (or low), I suppose they figure that's sufficient. I hope this helps.